PARENTING BOOKS ARE ESSENTIAL FOR ANY HOME WITH KIDS. When shopping for parenting books, whether at your local bookstore or online, you will be faced with a huge number to select from. There’s an overwhelming selection of books with parenting advice and tips out there and there is no way any parent can read so many. To help you choose some few good books from the huge pile available out there, we will post a monthly review of one of the parenting books we’ve read and loved here on Motherhood & More. First of all I owe a big “Thank You!” to the lady who introduced me to Gina Ford and her books. I was still pregnant back then, but this friend talked so passionately about Gina Ford’s book, and having applied the book’s information successfully twice – on her daughter and son- I had no doubt at all that I should buy it, read it, and subsequently apply all I learnt on my baby. One of the early concerns of parenting is weaning your baby on to solid foods. I honestly had no idea when or how and with what food exactly to start. Usually parents go with what their baby’s pediatrician recommends. Well in my case, I wasn’t quite satisfied with the pediatrician’s suggestions. Wanting the best for my baby I knew I had to do so much reading. Luckily this book saved me a lot of time and effort. 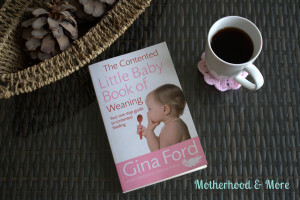 I loved Gina Ford’s book because it has it all! She explains when is the right time to wean, making sure that you follow the signs that your baby is actually ready for weaning. When you decide to go with it, Gina Ford walks you through weaning step by step, day by day, and week by week (seriously!! she is a life savior). She mentions what to cook, how to cook it, and how much to feed your baby. She always gives you many options, and at the end of each weaning stage she answers questions from real life moms. In addition to all that she has some awesome age appropriate recipes for each stage of weaning. Personally I love her recipe for “creamy pasta with spring vegetables” which is a perfect meal for all the family, and the “chicken casserole” recipe. In real life though, nothing is as perfect as in books. You will need to have patience with weaning, and many many adjustments according to your baby’s convenience. However, I believe that this is a book that you will not regret reading! So ladies, who of you has read this book? What do you think of it? Waiting to hear from you .. Enjoy reading and weaning !